The Balance project lets SNAP recipients check their balances via text message. Food stamp recipients can use text messages to find out how much they have left—while in line at the grocery store. 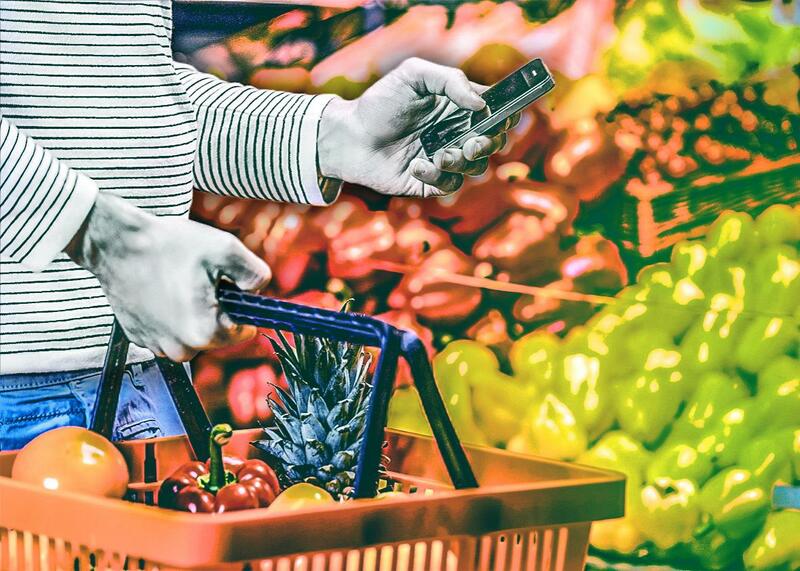 With Balance, people who use SNAP can check their balances from the grocery line. Photo illustration by Juliana Jiménez. Photo by Thinkstock. This piece was originally published in New America’s digital magazine, the Weekly Wonk. The days are getting colder and shorter in Anchorage, Alaska, but that doesn’t bother Brendan Babb much. He’s counting on the colder, shorter days to draw more people to the weekly hack nights he organizes with other members of the Code for Anchorage team. Code for Anchorage is one of dozens of volunteer groups across the country interested in “making government work better” with support from Code for America, a national nonprofit. Babb and the other programmers, activists, and concerned citizens who show up to these local hack nights are looking to use technology to address some of Anchorage’s most pressing problems: poverty and food insecurity. I met Babb at the Code for America Summit in Oakland, California, at the beginning of October. The annual summit is a chance for people from diverse fields to come together to learn about and create technological solutions to public problems. I came to the conference specifically to learn about civic technology projects focused on poverty and the needs of lower-income people. It’s one thing to run a startup, but I was looking for organizations that wanted to use technology to start up the most impoverished in their communities. Code for Anchorage’s work embodies that ethos. With support from the Code for America team and local experts on hunger, Code for Anchorage has successfully implemented a tool to help low-income Alaskans keep track of their Supplemental Nutrition Assistance Program (or SNAP, formerly known as food stamps) benefits. Since its advent in October 2014, the text message platform, called “Balance,” has allowed SNAP participants in Alaska to check their real-time balances with just a few keystrokes. (Balance is also up and running in other states, including Texas and California.) So far, this program has allowed a few dozen low-income Alaskans to check their balances quickly and easily. (There have been more than 440 uses of the system spread across 58 unique users—though Babb is quick to admit that his own checks of its functionality are counted there, too). However, with more than 90,000 Alaskans receiving SNAP in a typical month, there’s plenty of room to grow this system—and, with a few additional tweaks, Babb thinks they’ll be able to improve the tool’s reach. “Text-based applications are really interesting,” Babb says. Smartphones are indeed growing in use, but they’re not as much of a given as access to texting is. You don’t have to install an app to use Balance, nor do the developers have to worry about whether their users are on an Android or Apple phone. And it offers a sense of security: Balance users can check the tool in the privacy of their homes or at the supermarket while waiting in line to check out. This avoids the hassle—and potential embarrassment—of reaching the front of a long grocery store line only to discover you’re short on funds. Babb believes in both the promise and feasibility of expanding Balance’s use in Alaska. Sixty percent of Alaska-based Balance users have used it more than once, and many use it at the beginning or end of a month, indicating that they’re likely using it to help them budget their monthly benefits and plan accordingly. For now, Balance is available in both English and Spanish, but one of Babb’s goals is for it to be operational in Yupik, which is spoken by some Native Alaskans—and is the state’s second-most common language. And there are plenty more people who could be using this tool in English and Yupik alike. In addition to current SNAP recipients who aren’t using Balance, Babb estimates that more than 34,000 people (approximately 4 percent of all Alaskans) qualify for SNAP but aren’t yet participating. And the more people who use the app, the better: In addition to the potential to improve food security, outreach to boost participation in a program that brings federal dollars to local communities makes sense economically. Since roughly 40 percent of Alaska’s population is concentrated in Anchorage, even a modest increase in the local SNAP participation rate could generate a strong economic benefit through increased grocery store spending and from the local taxes associated with those purchases. Babb’s been “trying to make the case” to local politicians in this vein, recognizing that sometimes “economic development arguments work better” than more humanitarian-based appeals to alleviate poverty. By deploying the language of business (and bringing along clear data estimating the actual return on investment of increased SNAP participation), Babb appeals to those who identify as fiscally conservative. And, according to Babb, though Alaska is a politically conservative state, most Alaskans “have experience getting help from a stranger.” Those firsthand experiences with vulnerability and accepting assistance open people up more to the idea of giving back—and of coming to Babb’s hack nights. Balance is an example of the positive role technology can play in addressing persistent civic problems, like poverty and food insecurity, but it also reveals the work needed to create tools that actually address low-income people’s chief concerns. One of the challenges is simply getting the word out about Balance to potential users. Another is the need for more robust user testing to improve marketing of the tool and expand its reach. In addition to meeting directly with current and potential users, Babb sees potential in utilizing the local university’s computer science program, journalists, and the Mayor’s office to build both support and greater awareness of the range of technical tools that could support low-income Alaskans. Babb believes Alaskans are “capable and hungry for technical solutions” and that it’s just a matter of bringing together enough motivated people to keep working toward these solutions. But what also sets Code for Anchorage apart is that it’s building on one of the country’s most robust and well-established anti-poverty programs. By using technology to improve the reach and usability of SNAP, Code for Anchorage and other communities implementing Balance can make a profound difference in the lives of lower-income people. That’s surely a cause worth coding for. This piece was originally published in New America’s digital magazine, the Weekly Wonk. Future Tense is a collaboration among Arizona State University, New America, and Slate. Future Tense explores the ways emerging technologies affect society, policy, and culture. To read more, visit the Future Tense blog and the Future Tense home page. You can also follow us on Twitter.